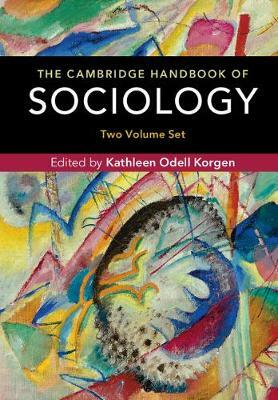 Whether a student, an instructor, a researcher, or just someone interested in understanding the roots of sociology and our social world, The Cambridge Handbook of Sociology is for you. The Handbook provides a survey of the field, covering its origins; core areas, including theory, methods, culture, socialization, social structure, inequality, and social change; specialties within sociology such as race, class, and feminist theories; and special topics (e.g. the sociology of nonhuman animals, the sociology of disaster, the sociology of mental health, the sociology of science and technology, the sociology of violence, environmental justice, and the sociology of food); and related fields (e.g. criminology, social work, social psychology, and women and gender studies). Each essay includes a discussion of how the respective subfield contributes to the overall discipline and to society. Written by some of the most respected scholars, teachers, and public sociologists in the world, the essays are highly readable and authoritative.